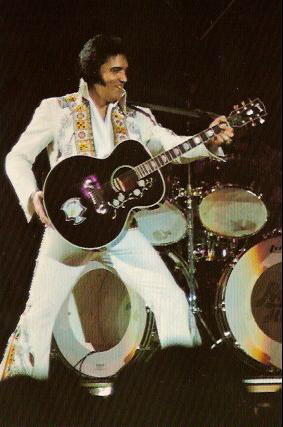 Elvis on stage in the 1970s never inspired me as much as his work in the fifties and sixties. I have been reminded in recent years that I am in the minority in that judgment. For instance, several years ago, Elvis Presley Enterprises conducted a poll on its “Elvis Insiders” web site. Members were asked to select their favorite Elvis era from among the following choices: (a) the Fifties, (b) the Sixties, and (c) the Seventies. I was torn between (a) and (b), but finally voted for the sixties. To my amazement at the time, (c) was the runaway winner in the poll. Really, though, it’s not surprising that so many Elvis fans identify with him in his jumpsuit years. That’s when most Americans finally had a chance to see him perform, either in Las Vegas or when he came to their hometowns. There are still many who saw him on stage in the fifties, but their numbers are dwindling with each passing year. I’m among those Elvis fans who first saw his ’70s road show. It was in Seattle in 1970. Don’t ask me for an account of that event, though, because, aside from the treasured memory of actually seeing Elvis in the flesh, the performance wasn’t memorable. I mean, he looked great and his voice was powerful—but that’s about all I can say about it. I have very few visual memories of the show, and I can only remember one song that he sang that evening (“You Don’t Have to Say You Love Me”). My view is (and please keep in mind that I am and always have been a loyal Elvis fan) that Elvis’s stage show in the seventies was nothing special. There were other entertainers at the time (Tom Jones is one who comes to mind) who were capable of generating as much excitement on stage as Elvis. In the fifties, on the other hand, Elvis was unique. Everyone I’ve talked to who saw Elvis then still has the image indelibly burned into their memories, and most call it one of the most exciting experiences of their lives. The same applies to journalists in the fifties. Most had never seen anything like Elvis, and so they reacted to him on an emotional level, one way or the other. That’s why the newspaper reviews of Presley’s shows in 1956 and 1957 are so interesting to read. In an effort to help readers visualize Elvis in motion, writers conjured up amazing metaphors and creative narratives. Most journalists in the seventies, however, seemingly struggled to make their reviews of Elvis’s shows sound interesting. Most of them failed to do so. 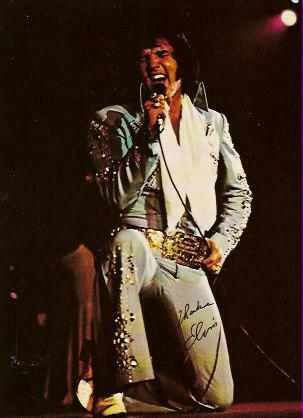 Occasionally, though, a handful of creative reviewers came up with colorful comments about Elvis’s shows in the seventies. Below are some pearls to be found in the sea of mediocre writing about Presley during that period. "He has a cape that Count Dracula wouldn’t have been caught dead in, and spattered with sequins laid out as if following the holes of a fusillade from a machine-gun."